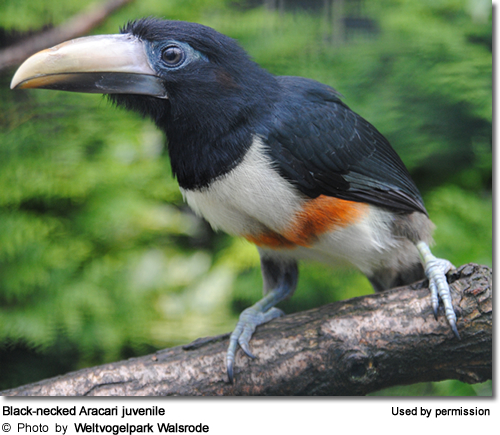 Toucans share their family name with toucanets and aracaris, with American barbets the most closely related family. 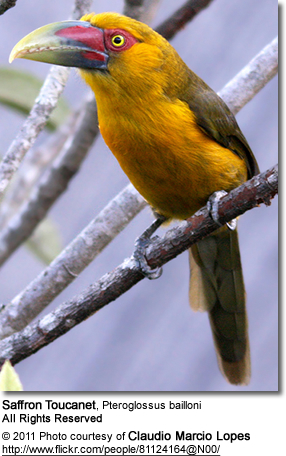 The family includes six genera and 42 different species of near passerine (arboreal land birds) of the order Piciformes. Of these, toucans comprise two genera, Genus Andigena and Genus Ramphastos, which consists of all the large black toucans which can be found in every Latin American country except Chile, with 16 species and sub-species. The Tupi Indians of Brazil are credited with the original name 'tucano' as translated into Portuguese. 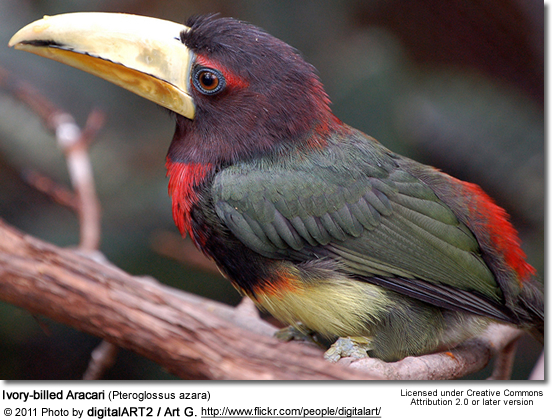 Toucans have distinctive coloration, markings, and are particularly noted for their large colorful bills. Toco Toucan is the most recognized because of the bird's iconic use in advertising, and is also distinguished as the largest at 25 in. (64 cm) long and by having the widest distribution, found not only in tropical areas and dry savannahs, but also lives in northern Argentina where night temperatures during the winter are near freezing. HOW HEAVY IS THAT BILL, TOUCAN, AND WHAT DO YOU EAT WITH IT? WHERE DO YOU LIVE, TOUCAN? 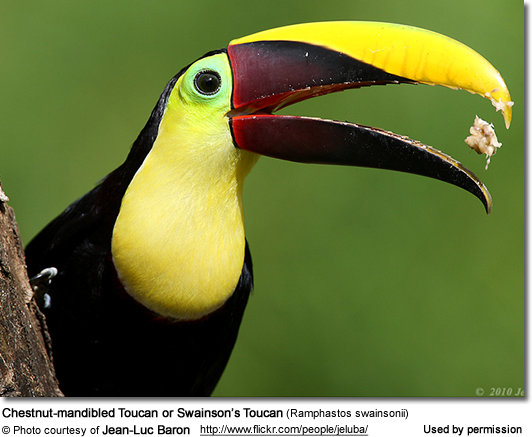 Toucans principally reside in tropical forests of South America, particularly in Brazil, Argentina, Paraguay, and Bolivia.A few species are indigenous to Central America as far north as southern Mexico. 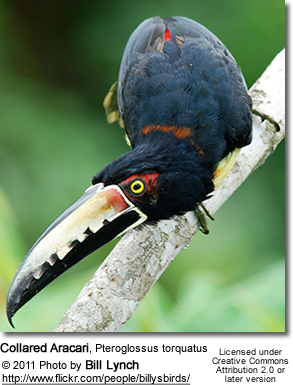 Toucans are non-migratory and found only at lower altitudes. These birds prefer to live in the tree canopies of rain forests in small groups of about six (sometimes more), although it is not uncommon to find a mated pair together. They hop from branch to branch on their short strong legs, enabled by their strong toes and claws, and bathe in water pooled in hollows of tree branches. They often share their food, throwing it into each others' mouths, and preen each other with the tips of their long bills, requiring them to sit far apart.When flying together there is no particular formation or line. The last three vertebrae are fused, joined to the spine with a ball and socket joint. This allows toucans to flip their tails above their bodies to touch their heads, the posture used for sleeping, with their bills protected and turned, resting on their backs causing them to resemble a ball of feathers. This compact posture allows many to roost together at night in even smaller hollows. Toucans can do well in captivity, either in cages or in large flights where they can co-exist with other similar-sized birds. Almost all species have been bred successfully in captivity under the proper conditions. WHAT IS PARENTING LIKE, TOUCAN? WHAT NOISES DO YOU MAKE, TOUCAN? 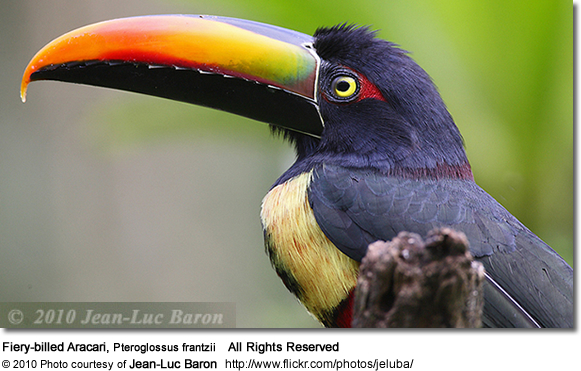 Toucans are known for their distinctive vocalizations consisting of a variety of constantly repeated shrill yelps. One of the most famous calls is described by locals as sounding like 'dios te de, te de, te de', and is likened to the Spanish for 'May God watch over you'. Some species are differentiated as making 'croaking' calls versus 'yelping' calls. Photo, Video and/or Article contributions are welcome! Upload articles and images. Thank you!